413 pages | 41 B/W Illus. Drawing on the expertise of decision-making professionals, leaders, and managers in health care organizations, Hospitals & Health Care Organizations: Management Strategies, Operational Techniques, Tools, Templates, and Case Studies addresses decreasing revenues, increasing costs, and growing consumer expectations in today’s increasingly competitive health care market. Using an engaging style, the book is filled with authoritative guidance, practical health care–centered discussions, templates, checklists, and clinical examples to provide you with the tools to build a clinically efficient system. Its wide-ranging coverage includes hard-to-find topics such as hospital inventory management, capital formation, and revenue cycle enhancement. Health care leadership, governance, and compliance practices like OSHA, HIPAA, Sarbanes–Oxley, and emerging ACO model policies are included. Health 2.0 information technologies, EMRs, CPOEs, and social media collaboration are also covered, as are 5S, Six Sigma, and other logistical enhancing flow-through principles. The result is a must-have, "how-to" book for all industry participants. Hospitals and Health Care Organizations is a must-read for any physician and other health care provider to understand the multiple, and increasingly complex, interlocking components of the U.S. health care delivery system, whether they are employed by a hospital system, or manage their own private practices. The operational principles, methods, and examples in this book provide a framework applicable on both the large organizational and smaller private practice levels and will result in better patient care. 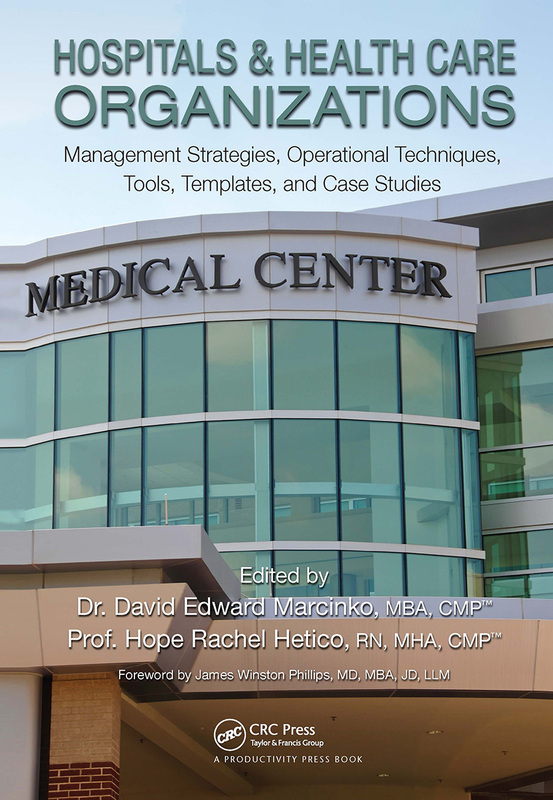 Physicians today know they need to better understand business principles and this book by Dr. David E. Marcinko and Professor Hope Rachel Hetico provides an excellent framework and foundation to learn important principles all doctors need to know. … Dr. David Edward Marcinko and Professor Hope Rachel Hetico bring their vast health care experience along with additional national experts to provide a health care model-based framework to allow health care professionals to utilize the checklists and templates to evaluate their own systems, recognize where the weak links in the system are, and, by applying the well-illustrated principles, improve the efficiency of the system without sacrificing quality patient care. … The health care delivery system is not an assembly line, but with persistence and time following the guidelines offered in this book, quality patient care can be delivered efficiently and affordably while maintaining the financial viability of institutions and practices. Dr. David Edward Marcinko is a health care economist, managerial and technology futurist, and former board-certified surgeon from Temple University in Philadelphia. In the past, he edited seven practice-management books, three medical texts in two languages, five financial planning books, dozens of interactive CD-ROMs, and three comprehensive administrative dictionaries for physicians, accountants, attorneys, medical management consultants, and health care business advisors. Internationally recognized for his work, he provides litigation support and expert witness testimony in State and Federal Court, and has clinical publications archived in the Library of Congress and the Library of Medicine at the National Institutes of Health. His thought leadership essays have been cited in journals such as Managed Care Executives, Healthcare Informatics, Medical Interface, Plastic Surgery Products, Teaching and Learning in Medicine, Orthodontics Today, Chiropractic Products, Journal of the American Medical Association, Podiatry Today, Investment Advisor Magazine, Registered Representative, Financial Advisor Magazine, CFP Biz (Journal of Financial Planning), Journal of the American Medical Association(JAMA.ama-assn.org), The Business Journal for Physicians, and Physician’s Money Digest; by companies and professional organizations such as the Medical Group Management Association (MGMA), American College of Medical Practice Executives (ACMPE), American College of Physician Executives (ACPE), American College of Emergency Room Physicians (ACEP), Health Care Management Associates (HMA), and PhysiciansPractice.com; and by academic institutions such as the UCLA School of Medicine, Northern University College of Business, Creighton University, Medical College of Wisconsin, University of North Texas Health Science Center, Washington University School of Medicine, Emory University School of Medicine, and the Goizueta School of Business at Emory University, University of Pennsylvania Medical and Dental Libraries, Southern Illinois College of Medicine, University at Buffalo Health Sciences Library, University of Michigan Dental Library, and the University of Medicine and Dentistry of New Jersey, among many others. Dr. Marcinko also has numerous primary and secondary editorial and reviewing roles to his credit. Dr. Marcinko received his undergraduate degree from Loyola University, Maryland, completed his internship and residency at Atlanta Hospital and Medical Center, is a Fellow of the American College of Foot and Ankle Surgeons, and earned his business degree from the Keller Graduate School of Management, Chicago, and his financial planning diploma from Oglethorpe University, Atlanta. He was a licensee of the Certified Financial Planner Board of Standards, Denver for a decade and holds the Certified Medical Planner designation (CMP). He earned Series #7 (general securities), Series #63 (uniform securities state law), and Series #65 (investment advisory) licenses from the National Association of Securities Dealers (NASD) and a life, health, disability, variable annuity, and property-casualty license from the State of Georgia. Dr. Marcinko was also a cofounder of an ambulatory surgery center that was sold to a public company and has been a Certified Professional in Healthcare Quality (CPHQ); a certified American Board of Quality Assurance and Utilization Review Physician (ABQAURP); a medical-staff vice president of a general hospital; an assistant residency director; the founder of a computer-based testing firm for doctors; and the president of a regional physician practice-management corporation in the Midwest. He was a member of the American Health Information Management Association (AHIMA) and the Healthcare Information and Management Systems Society (HIMSS); a member of the Microsoft Professional Accountant’s Network (MPAN); a Web site engineer and beta tester for Microsoft Office Live Essentials program and a Microsoft Health User’s Group (MS-HUG) member; and a registered member of the U.S. Microsoft Partners Program (MPP). Moreover, as the president of a privately held physician practice-management corporation in 1998, he consolidated 95 solo medical practices with $50 million in revenues. Currently, Dr. Marcinko is the Chief Executive Officer for the Institute of Medical Business Advisors (MBA), Inc. The firm is headquartered in Atlanta, GA, and works with a diverse list of individual and corporate clients. It sponsors the professional Certified Medical Planner (CMP) charter designation program and counsels maverick physicians, health managers, and financial advisors transitioning to niche health care advisory careers. As a nationally recognized educational resource center and referral alliance, the MBA Institute and its network of independent professionals provide solutions and managerial peace-of-mind to physicians, health care organizations, and their consulting business advisors. A favorite on the lecture circuit, Dr. Marcinko is often quoted in the media and frequently speaks on related topics throughout this country and Europe in an entertaining and witty fashion. He is also a social media pioneer and publisher of the Medical Executive Post, an influential syndicated Health 2.0 interactive blog forum. Dr. Marcinko is available to colleagues, clients, and the press at his corporate office in Atlanta. Hope Rachel Heticoreceived her nursing degree (RN) from Valpariso University and her Master of Science in Healthcare Administration (MSHA) from the University of St. Francis, in Joliette, IL. She is the author’s editor of a dozen major textbooks and is a nationally known expert in managed medical care, medical reimbursement, case management, health insurance, security and risk management, utilization review, National Association of Healthcare Quality (NAHQ), Health Education Data Information Set (HEDIS), and Joint Commission on Accreditation of Healthcare Organizations (JCAHO) rules and quality compliance regulations. Prior to joining the Institute of Medical Business Advisors as Chief Operating Officer, Ms. Hetico was a hospital executive, financial advisor, insurance agent, Certified Professional in Healthcare Quality (CPHQ), and distinguished visiting assistant professor of health care administration for the University of Phoenix, Graduate School of Business and Management in Atlanta. She was also the national corporate Director for Medical Quality Improvement at Abbey, and then Apria Healthcare, a public company in Costa Mesa, CA. A devotee of health information technology and heutagogy, Ms. Hetico was also responsible for leading the Web site www.CertifiedMedicalPlanner.org to the top of the exploding adult educational marketplace, expanding the online and on-ground CMP charter designation program, and nurturing the company’s rapidly growing list of medical colleagues and financial services industry clients. Professor Hetico recently completed a project for Resurrection Health Care in Chicago, and is currently at Saint Joseph’s Hospital in Atlanta, GA.
Mackenzie H. Marcinkois project manager and a linguistic intern from the Marist School, Atlanta, GA.